There are few things as nice as a well wrapped gift that is personalized to the taste and style of it's recipient. 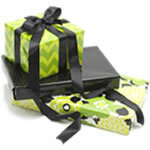 We offer a huge selection of gift wrap styles to choose from. Pick a style that fits your retail store and really personalize your products for your customers. Most wraps sold in 200, 400, and 833 foot rolls. All giftwraps are sold in rolls 24" wide.